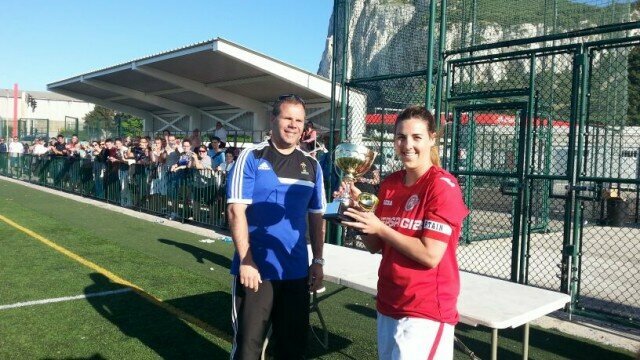 The Senior Ladies won the Ladies Rock Cup against St Joseph’s this weekend. 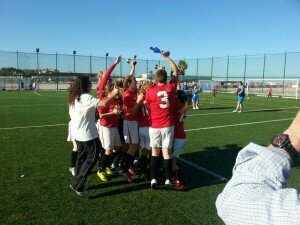 St Joseph’s took the lead but the Girls came back to win 4 – 1, it was a brilliant performance form the Reds. The girls started the game a bit nervous and forced the defence to have some trouble, but they where able to holding off the St Joseph’s attack, eventually Man62 defender was forced into making a harsh tackle and St Joseph’s were awarded with a free kick in a dangerous position. Although the Red keeper caught it, it just slipped out of her hands and St Joseph’s went into the lead 1-0. The girls quickly reacted to the score line and started attacking non stop until a a good cross into there area was made and Naomi Victor finished with a slide tackle into goal and scored leveling the score 1 – 1. The second goal came late in the first half as Naomi took a smarter option in a freekick and instead of going for goal she passed it to Gynaika Mena who scored 1-2. Half time passed and the girls went in exactly like they finished the first half, attacking and causing there defence alot of problems, Shanice Bebeagua made it 1-3 as she shot from outside the area right in the top right corner, the game was intense but by this point St Joseph’s were frustrated which just made the game alot easier for the Reds. Minute’s before the ref blew the final whistle we got a corner which did not disappoint, Zoe Ballantine crossed it in and Joelle Gilbert which was at the back post headed it in to confirm what we already knew, 1-4 and that was it for St Joseph’s. The Senior Men finished the season with a well deserved draw against the league Champions Lincoln FC. Final score 1 – 1. Manchester 62 Red Under 9 played against Lincoln who had strengthened themselves with a couple of older players. From the outset the Reds dominated the game with Lincoln not coming close enough to bother the Man62 goalkeeper. 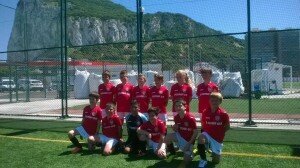 Early on the game the Reds went 2 – 0 ahead with Jamie Cortes and Jack Sherriff getting on the score sheet. Then on a one off attack Lincoln managed to get a corner from which unfortunately the team scored an own goal. Minutes later Carl De Torres managed to score a third and then on the final minutes of the first half the referee awarded a non existent penalty in favour of Lincoln which Reds keeper Noah Sene managed to stop but was unable to keep the ball and saw a Lincoln player tap in on the rebound. The first half came to an end with the Reds in front by a narrow lead of 3 – 2. The second half started with the Reds pushing hard with a view of putting the game beyond Lincoln. By Midway through the second half and with the Reds totally dominating the possession Renai Marcus grabbed a couple of good goals taking our the score to 5 – 2, then finally when we thought the game would finish with this score Nick Andrews managed to score our sixth. The game finished with a final score of 6 – 2 for Manchester 63 Red. It’s been a really good but hard first season for the team at under 9 level having to get to grips with the larger pitch together with the longer games and only narrowly missing out on winning the B League cup. Next year will see us on our second year and the older teams having gone up to U11 level will hopefully put us in contention to win the league. Well done to the team. Jamie Bray – who decided to stop playing football midway through the season. The Coaches would like to give a special thanks to all the parents who have shown the commitment to take their children to the training sessions and then also support the team week in week out during games.